Hilton Head Island, a crown jewel of the hauntingly picturesque Lowcountry of South Carolina, continues to generate impressive headlines. For the third year in a row, Travel + Leisure magazine ranked Hilton Head as the “No. 1 Island in the Continental United States.” Meanwhile, Condé Nast Traveler proclaimed Hilton Head its top choice in the 2018 Readers’ Choice “Best Islands in the U.S.” poll for the second consecutive year. Hilton Head outranked four Hawaiian Islands — Kauai, Maui, Oahu and the Big Island. Kiawah was the only other South Carolina Island that made the list, coming in at No. 3. Condé Nast editors raved about Hilton Head, saying the island feels “a world apart” from the South Carolina mainland, offering something for every type of traveler — from golfers to foodies to beach bums and everything in between. They noted Hilton Head’s restaurants serve up the type of cuisine that competes with major cities. The first eco-planned vacation destination in the United States, Hilton Head is the largest barrier island off the Atlantic Ocean coast between Long Island and the Bahamas, covering 42 square miles — 12 miles long and 5 miles wide at its widest point. The local population of Hilton Head hovers around 38,000. But with more than 2.5 million visitors a year, the island never feels small. With limitless things to do and a delightfully perennial climate beckoning to be savored throughout the seasons, Hilton Head is a natural magnet for a spectrum of sports, recreation and outdoor leisure. Boasting nearly two-dozen golf courses on the island alone, Hilton Head offers something for everyone — and every budget. More than a million rounds of golf are played on Hilton Head annually — more golf per capita than any place in the country. While some of its top courses are private, Hilton Head has earned its reputation as one of the world’s finest golf destinations, primarily due to its outstanding public and resort courses that will satisfy the palate of even the most selective golfer. Snuggled between Savannah and Charleston, Hilton Head is shaped like a boot, and the island’s real estate and resort developments are known as plantations. Sea Pines Resort, home of Harbour Town Golf Links and two other storied layouts, is located at the “toe” or the south end of the island. 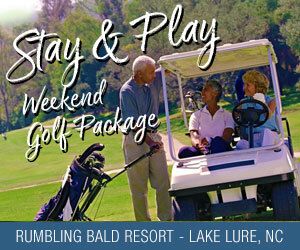 Located at the “heel” — meaning mid-island and north end — are Palmetto Dunes Oceanfront Resort with its Robert Trent Jones, George Fazio and Arthur Hills courses, and Port Royal Resort with 54 holes designed by Pete Dye, George Cobb and Willard Byrd. Nearly every renowned golf course architect of this generation has representative work on the island. Along with the names above, add the likes of Jack Nicklaus, Arnold Palmer, Gary Player, Rees Jones, Davis Love III and Robert Cupp. In late 1960, Hilton Head golf debuted in The Sea Pines Resort. Spanning the southern third of Hilton Head and located along 5,000 oceanfront acres, Sea Pines offers an array of outdoor activities for individuals, families and groups, including five miles of sandy beach shoreline and a 15-mile network of manicured bike and walking paths. All are within a short distance of a variety of accommodations and Hilton Head Island’s premier hotel, The Inn & Club at Harbour Town. Today, Harbour Town Golf Links remains a lasting monument to southern coastal golf. Every hole at Harbour Town has its own unique flavor and the finishing trio is one of the most breathtakingly challenging anywhere. The home hole with its view of the candy-cane lighthouse is the most famous, but the 185-yard, par-3 17th, which overlooks Calibogue Sound and across to neighboring Daufuskie Island, conjures up the perfect Lowcountry ambience. The PGA Tour makes its only South Carolina stop at Harbour Town each April for the RBC Heritage of Golf. 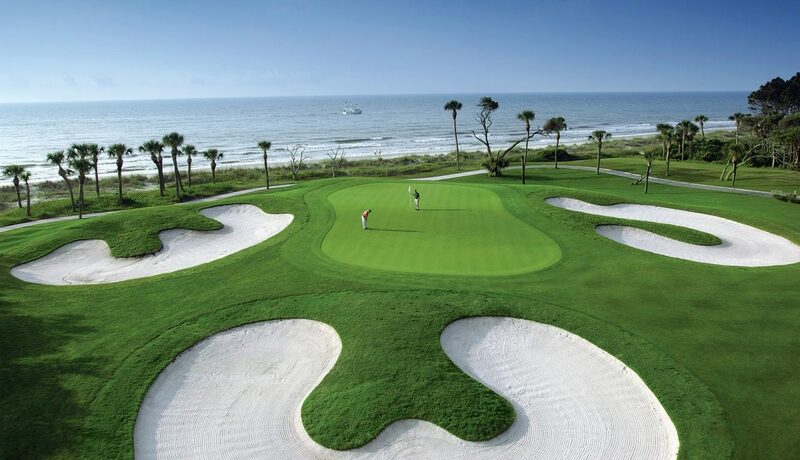 Meanwhile, the Golf Course Owners Association recently named Sea Pines Resort’s new Atlantic Dunes by Davis Love III “National Course of the Year.” Atlantic Dunes is a complete reconstruction of Sea Pines Resort’s historic Ocean Course. Not to be outdone, Sea Pines Resort’s original Sea Marsh Golf Course received a multimillion-dollar transformation in 2007 and is now called Heron Point by Pete Dye. The Sea Pines Resort recently unveiled the “Pete Dye Room” at the Harbour Town Clubhouse, celebrating the life and times of one of the all-time best designers. In one of the most comprehensive golf course architecture museums in the world, three videos offer insight into Dye’s philosophy and work ethic: In one, professional golfers and friends discuss their favorite Dye holes and courses; another relives the magic of the most famous shots on his courses; and a mini-documentary looks deeply into the creation of Harbour Town Golf Links, and how Dye’s process as a builder revolutionized course design and play. Just a smooth 9-iron from Sea Pines on Hilton Head’s south end is Shipyard Plantation, which offers 27 holes designed by Cobb and Byrd that can be played in a trio of 18-hole combinations. Anchoring Hilton Head’s mid-island and bounded by three miles of Atlantic Ocean beach on one side and a sheltered Intracoastal Waterway marina on the other, Palmetto Dunes Oceanfront Resort offers a storied history of unparalleled golf experiences for guests from all corners of the globe. Named No. 3 “Best Resort in the South” in Condé Nast Traveler’s 2017 Readers’ Choice Awards and to the top 25 World’s Best Family Getaways by Travel + Leisure, the Palmetto Dunes features vacation home and villa rentals, three world-class golf courses, an award-winning tennis and pickle ball center, an 11-mile inland salt-water lagoon system for kayaking and fishing, and Hilton Head Outfitters for bike rentals, canoes, kayaks and fishing. The trio of golf courses at Palmetto Dunes has each been honored with South Carolina’s “Golf Course of the Year” award in the past 15 years. On Hilton Head Island’s northwestern point is Port Royal Resort — home to the original landing site of William Hilton, the explorer for whom the island is named. Within reach of approximately 12 miles of beach where Port Royal Sound joins the Atlantic Ocean, Port Royal offers a trio of distinctly different 18-hole golf courses. Robber’s Row was designed in 1967 by Cobb and Byrd, and was redesigned in 1994 by Dye. Located on the scenic marsh side of the Port Royal Plantation atop former Civil War grounds and featuring historical markers throughout, the layout winds through beautiful strands of magnolia and live oaks. The Barony Course opened in 1963 and was one of Hilton Head’s first courses. From the tee box, many of the holes appear to be relatively open, but as golfers approach the recently resurfaced Bermuda greens, the challenge becomes clear. Port Royal’s youngest course is Planter’s Row, which Byrd designed in 1983. Offering a different feel from its sister courses, with water on 10 of 18 holes, Planter’s Row is a great challenge due to its narrow, tree-lined fairways and small, undulating greens. Like Sea Pines and Palmetto Dunes, Port Royal is also renowned for its world-class tennis center and other outstanding amenities, including the luxurious Westin Hilton Head Resort & Spa. Several miles north of Port Royal is Hilton Head Plantation, the second-oldest private gated community on the island occupying almost 4,000 acres. Hilton Head Plantation offers a wide variety of golf with a quartet of gorgeous layouts: Oyster Reef Golf Club, Country Club of Hilton Head and Bear Creek Golf Club —all designed by Rees Jones — along with Dolphin Head, designed by Gary Player and Ron Kirby. Oyster Reef Golf Club opened in 1983 and was immediately lauded as one of the country’s best new resort courses. Carved out of 190 acres of breathtaking Lowcountry terrain, Oyster Reef is home to one of the most spectacular golf holes on the entire island — the par-3 sixth hole plays 192 yards from the championship tees to a green that is set against the backdrop of the beautiful Port Royal Sound. Winding lagoons, lush vegetation and scenic views of the island surround Oyster Reef’s spectacular layout. Also on the north end of the island, Indigo Run Plantation boasts a pair of courses designed by Jack Nicklaus and his son, Jack Nicklaus II. The public access Golden Bear Golf Club puts a premium on strategy and finesse, rather than sheer power. Opened in 1992, Golden Bear flawlessly winds through forests of pine and oak and along freshwater lowlands. A new website — www.HiltonHeadGolfIsland.com — has been launched for information, while United Airlines recently announced it will open three new nonstop flights from Hilton Head Island Airport to Washington Dulles, Chicago O’Hare and Newark N.J., beginning in late March 2019. With all the recent changes, the legend of Hilton Head Island continues to flourish.